My favorite house and decorating style is modern, and I was thrilled when OFB included these very simple windows. Even though they are missing some some counter top height windows and privacy height, I still use them a lot. So I decided to add the heights that I wanted. This set contains Part I of the single tile windows. Embrasure - This is the full height all glass version. I added three different heights. The Privacy lines up with the vents on the Breech, the Mid sits just above counters, and the Short falls in between. Breech - This is the full height one with the vent on top. I added the full vent privacy, and the Mid height with the vent on top that sits just above the counters. 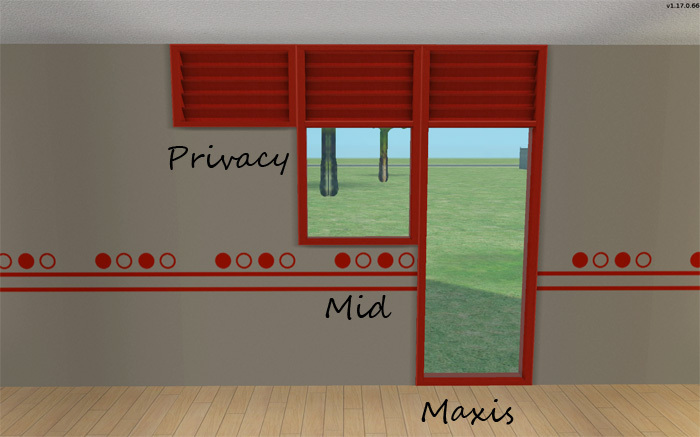 All windows take there textures from the full size counterpart window in OFB. 1300 people have said thanks to HugeLunatic for this download.